The years from 1997 to 2000 were an exciting time of evolution and growth. I thought I knew it all regarding training, especially as at the time I was a Sixth Dan in Taekwondo and had a long career as a competitor. It seemed the deeper I dug into the martial arts, the more I realized the vastness of their collective potential. The Academy in Kent got invitations to take part in the “Clash of the Titans” events, a famous British team sparring competition sponsored by MAI magazine. 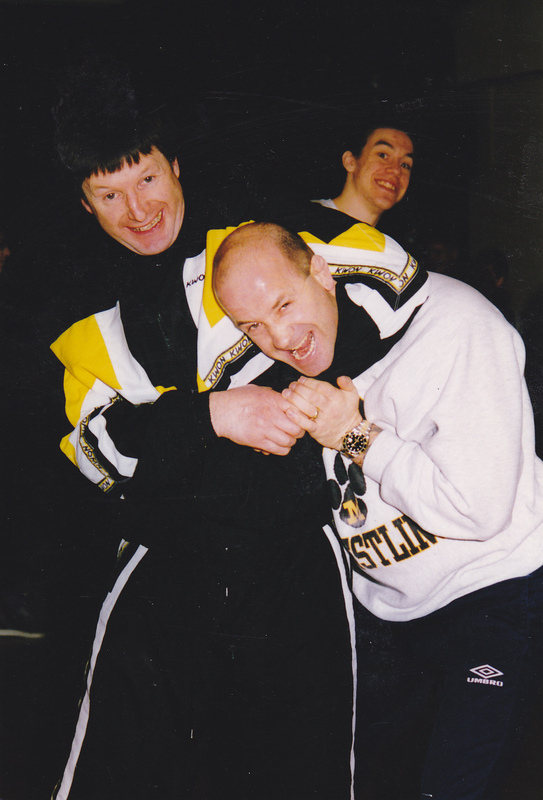 It helped to focus on building up a sparring team that would have to stand up to the best in the country. We had over 200 students in our Academy, but only 85 were adults of which roughly 15 of these were eligible for this type of competitive training. The experience we gained taking on groups that were numerically much greater than ours won us admiration from the martial arts fraternity. 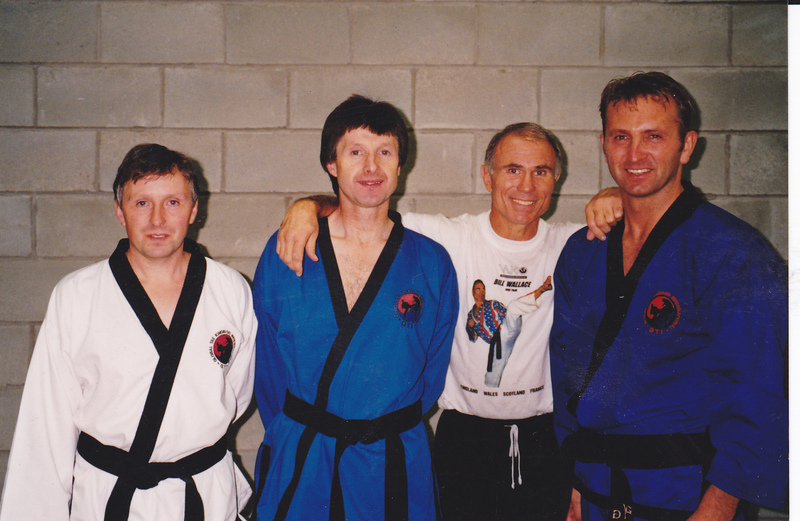 Some of our most memorable encounters were with The Welsh Dragons trained by Chris Sparks, Taekwondo Ireland trained by Don Dalton, and PUMA trained by Mark Ogbourne and Ray Gayle. However the greatest benefit of all from these competitions was the development and popularity of the conditioning classes which were open to everyone. It just proves that most folk do not wish to compete but certainly have a desire to become healthy and fit. The “Clash” Conditioning and Fitness training remained popular at the academy even when we stopped competitions. 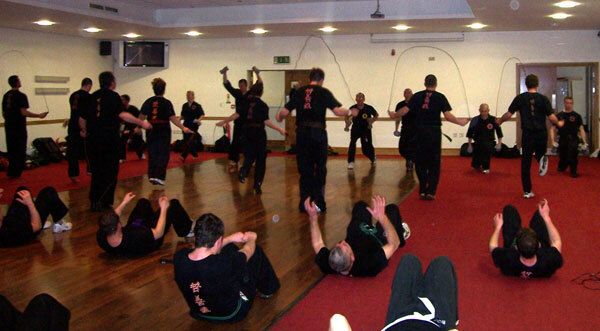 Every Saturday we had about a two hour class with a mix of conditioning exercises like skipping, sit ups and press ups and tons of focus pad drills. There was also lots of bag work and circuit training with light weights, grappling and trapping elements as well as the cardiovascular drills, and we would finish with some Tai Chi . 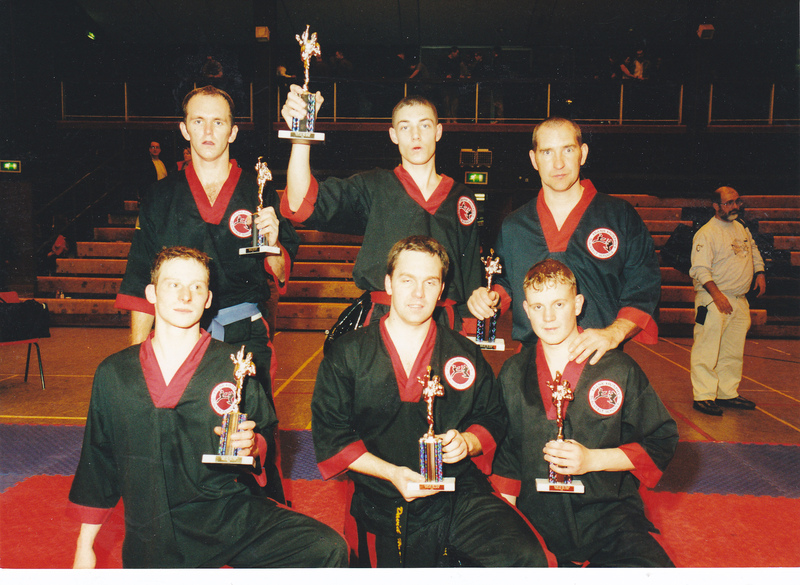 Our next move was to make a wish list of the top ten martial arts instructors who existed in the UK at that time (1999) and we had this audacious plan to see if these ten masters would travel down to Kent to our little academy and conduct seminars for us. We decided on three from the Taekwondo fraternity, and the other seven were from other styles, so our members could have exposure to these top professionals and styles had to offer. They included Geoff Thompson, Rick Young who trains to this day with Dan Inosanto in the US. Dan Inosanto was Bruce Lee’s right hand man sparring companion all of Bruce Lee’s life. Others included; Taekwondo veteran, Master Ted Hopwood, one of the first original pioneers of Taekwondo in Britain, the epitome of indomitable spirit, Tony Sewell former 3 times ITF and WTF World Taekwondo sparring champion, Shabir Akhtar, former world and European Taekwondo Sparring champion, an expert in Wing Chun, Tai Chi and qualified ABA Boxing coach. Bob Sykes, who most people know as the editor of Martial Arts Illustrated, but in my view totally underrated, a balanced martial artist and if anyone over trains, with unmatched humility, he is the man; Buster Reeves (who is now Brad Pitt’s stunt man). 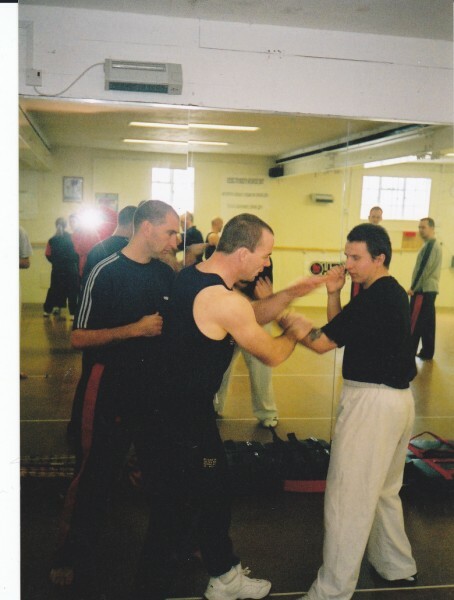 Conditioning expert; Micky Burns, who trained Gary Daniels, who went on to be a martial arts movie star in America; Rich Mooney an American Pressure Point Expert; Other luminaries included Merseyside’s Steve Sharkey, a world contender when it comes to imparting his vast knowledge of martial arts and Mark Weir. To our surprise they each in turn agreed and whether they realized then back in 1999, they were the beginning of the framework for Kaizendo, the martial arts system I developed, together with the support of my wife Catarina, who holds a Masters Degree in Physical Education form Loughborough University. 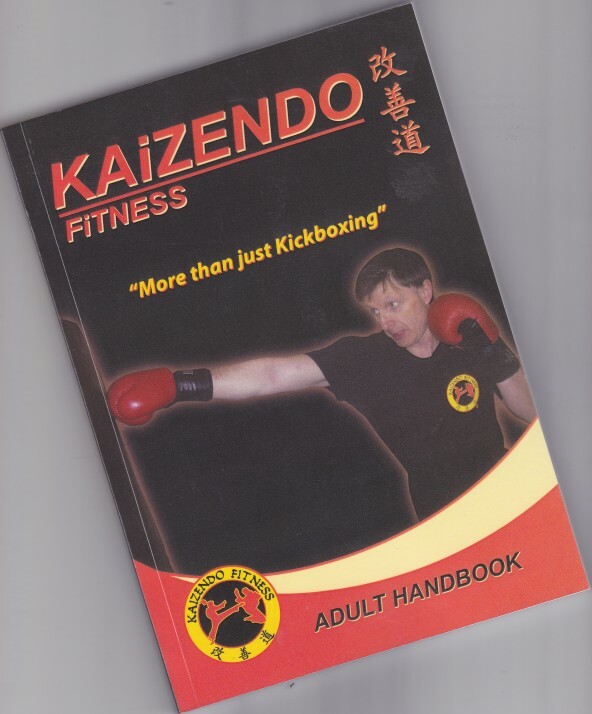 Kaizendo was a system developed, with the purpose to offer martial arts to everybody, other than just the young, flexible and highly athletic. 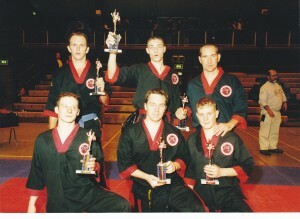 In 1999, I found I was turning people away from my academy, simply because they felt Taekwondo was beyond them. 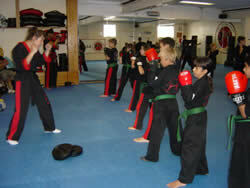 I wanted to keep the Taekwondo practised in the Academy traditional, and a good standard. So I introduced Kaizendo Kickboxing as a playground for the exploration of other martial arts and for the benefit of many others. The word ‘Kaizendo’ was chosen because it is a Japanese term for ‘The Way of Constant and Never Ending Improvement’. It has been designed to suit primarily older adults ages 40+ but is enjoyed by teenagers and young adults. It is a dynamic martial arts and fitness system that scientifically teaches basic boxing combinations, low kicking, resistance training, stretching, relaxation techniques and effective self defense. The curriculum is strategic and scientific making it unique and effective. 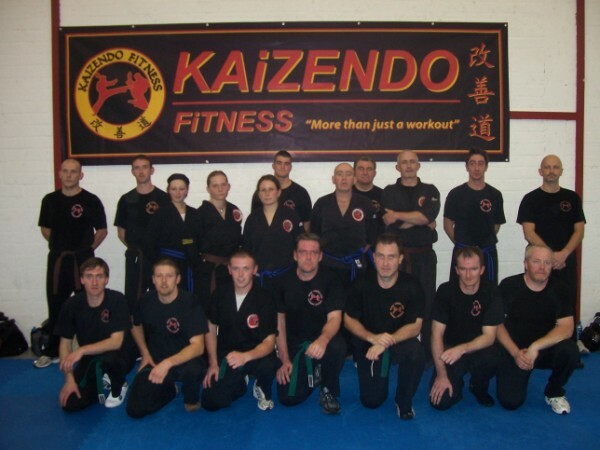 We started our first Kaizendo classes for children and adults in the Academy and sometimes we trained in North West Kent College. 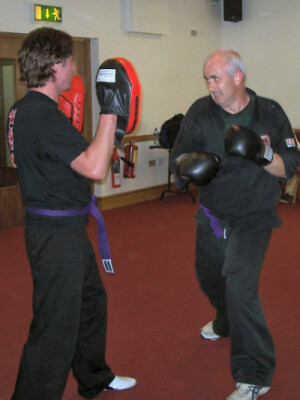 Apart from the physical drills, we included emotional and psychological aspects of martial arts training for confidence building and motivational techniques to spur extra effort and perseverance while training gives results. We also introduced softer elements of training into Kaizendo, which are mainly done in the cool-down part of the class. This involves Stretching, some Yoga techniques, Tai Chi and breathing exercises. Kaizendo was also very successful with children as Catarina had been influenced by her studies in Physical Education at Loughborough University and was also a columnist for Black Belt magazine where she ran a monthly column for instructors who taught martial arts to children. It also had a great input from Master Steve Sharkey who developed the ‘Bully Buster’ course and had great experience with teaching and dealing with children during his years in the police force. We continued to develop the Kaizendo in the Republic of Ireland and there are now clubs who practice this system both in Ireland and the UK. Today the training landscape is a lot different from when I started in 1974. Changes are happening on an unprecedented level in many people’s lives, and when change happens, experience has taught me that past success, no matter how great it was, doesn’t guarantee us anything. As martial artists, taming the ego is still our biggest battle to win. The best instructors believe in fairly tough but very enjoyable training, and not just physically, but mentally. It requires us to become more evolved individuals, where you have to use self control at a higher level. Abstinence from certain foods, that will not benefit a healthy lifestyle, or from judging others takes discipline to another level and if we look hard enough we will always find ways to evolve and grow. An open attitude towards life long learning is very important for any martial artist. Recently I have been fortunate to have experienced a training course under the guidance of Mark Lee of the Real World Combat and Fitness Gym in Drimoleague, West Cork. We all know that we will need energy and vibrancy if we are to enjoy a healthy life. We all know that some days may be tougher to get through than others. We, in particular those of us who are over 40, know we must keep a watchful eye on our health as we get older and it is for these days that we must prepare for. All martial arts regardless of style are beneficial. But the skills and benefits will always and forever vary from art to art and person to person. Respect other martial arts, because everyone is different, and no one size fits all. I have been fortunate to have had the experiences with Taekwondo and the opportunities to experiment other martial arts. I wish you all the very best in your martial arts journey.